Were here to assure that when you choose Fence Workshop™ for your next aluminum pool fence, you’re choosing quality. Supplying your new aluminum pool fence has never been easier in Georgia, Florida and North Carolina. Our expert staff has been supplying aluminum pool fences in the Southeast for almost a decade. Our aluminum pool fences are strong, beautiful, will never rust, never need to be painted and they come with a best in class manufacturer warranty. Because our aluminum pool fences are customizable with rings, finials, and more, it’s easy to find or design a style of fence that you are sure to love. Don’t have a swimming pool but considering getting one in the future? If building a fence consider going ahead and installing a style of fence that will meet national and local pool codes. An additional benefit of our aluminum fencing over the competitions is the thickness of our post walls. Our post walls are almost twice as thick and have an internal support in them as well, thus allowing the product to be ADA compliant. The major difference in regular aluminum fencing and our aluminum pool fencing, is the air spacing between the pickets. Our Ameristar™ ForeRunner® pool fences have BOCA specific air space, whereas commonly used regular aluminum fencing has more. These fences are manufactured in the US, come with a best in class manufacturer’s warranty and are specially designed for pools and to meet national and local pool codes. Our aluminum pool fence panels come in a variety of styles and meet U.S. BOCA national pool codes. Our aluminum pool fencing is available in a variety of colors and style options. By working with any of our professional project managers, they will help to inform you of all pool code requirements, such as National BOCA pool codes. Not only do we offer the wide range of products featured by Ameristar, we have also recently teamed up with Ultra Aluminum and Alumi-guard fences to fully encompass almost every style of aluminum fencing style available. We buy direct from the these top 3 aluminum manufactures in the U.S. for a reason, it gives our customers almost any design option – from colors, picket styles, ornate additions screwless options, rackable panels and the most up to date to new fence designs it is safe to say Fence Workshop™ has Georgia, Florida and North Carolina covered with options for Aluminum Fences. Where does Fence Workshop™ supply aluminum pool fencing? 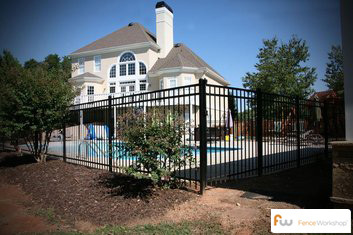 At Fence Workshop™ we supply aluminum pool fences in Georgia, Florida and North Carolina areas like Atlanta GA, Athens GA, Augusta GA, Columbus GA, Macon GA, Savannah GA, Valdosta GA, Destin FL, Jacksonville FL, Orlando FL, Tallahassee FL, Tampa FL, Apex NC, Cary NC, Chapel Hill NC, Holly Springs NC, Raleigh NC, Wake Forest NC and many more.